These nutty soybeans come frozen in pods or shelled. They’re a great choice for weight loss because they’re filled with protein, which will help you feel full. 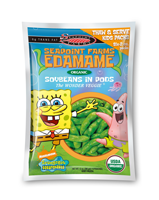 Seapoint Farms offers individual packets of soybeans with Dora or SpongeBob on the bag, which might help motivate your child to eat them along with you. One Dora–embellished pack of shelled edamame has only 59 calories. Find it in the organic freezer section of your supermarket. A bag of eight 1.5-ounce packs costs about $3.19.